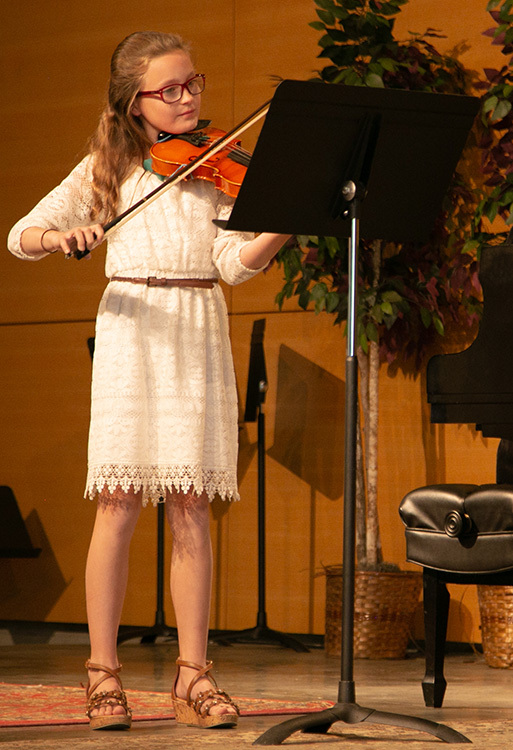 Spring Recital Day is a special time for students to share their talents. During weekly lessons, instructors enjoy helping students select a recital piece that reflects their musical accomplishments and that highlights their musical style. On Recital Day, students, instructors, and friends gather to celebrate the student’s accomplishments over the past year. The goal of Recital Day is not perfection, but rather celebration. Recitals are not mandatory for our students, but highly encouraged so that students can share their musical talents with family and friends. Instructors skillfully coach students during weekly lessons to ensure Recital Day is a positive experience. Recitals take place on Dawson’s campus during a Sunday afternoon in April. Each recital highlights the studio of a particular Academy Instructor. When students join together with other students to celebrate their musical gifts, excitement fills the campus. Recitals provide an opportunity for family and friends to show their support for students’ musical progress. After each recital, students and their families enjoy picture time and refreshments. Recital Day provides a wonderful showcase opportunity for a year’s investment in musical adventures.